Have You Ever Missed an Entry in a Cozy Mystery Series You Love? Shame on me! Here I’ve had a Cozy Mystery site devoted (as in absolutely, totally devoted!) to Cozy Mystery authors’ series listed chronologically since 2006, and I accidentally skipped a Cozy by one of my very favorite authors!!! As a lot of you who have been with me for years know, I’m a firm believer of reading a Cozy Mystery series in its chronological order. I like “growing with the characters.” The regular characters in the books become “friends” to me, and I look forward to spending time with them. I like catching up with them and finding out what they have been up to since they last solved a crime. Also some of you know that I follow Edie Claire‘s Leigh Koslow Never Mystery Series. I have “known” Leigh since she was single, and watched as she matured to the “woman she is today”. My (grown) daughter and I were talking (no, she’s still in Washington, DC – these days I have to rely on our cell phones) last week when I told her that I had just finished the latest Leigh Koslow mystery. (My daughter reads only a very few Cozy series – of which this is one.) She knows how I only read holiday Cozies during their corresponding holidays – so she seemed surprised. She went on to tell me that she enjoyed that last Christmas Cozy. So, here’s my question: Have you ever accidentally skipped a book in one of your favorite Cozy Mystery Series? And, if so, did it affect the next book in that series that you read? How did you find out that you had missed an entry? I mean, have you ever read a book in one of your very favorite series out of order and then when you went back to read the previous book, did it seem out of sequence? (I don’t think I’m explaining this very well…) Please post a comment to let us know. Thanks! I DO read series in order. Sue Grafton makes it easier to keep track. I make print outs of favorite authors with books listed in order. I feel like a death in the family when I miss or skip the next in the series. Before the hurricane, I stocked up on series. Thanks for caring. You are my go to site. Lucy, thanks for making me your “go to site”! I still can’t believe I accidentally skipped this book! I try to only read my holiday mysteries during their corresponding seasons (I’m lining up some of my Halloween picks already – am making myself wait a few weeks — well, I should say I’m trying to make myself wait …) so the only thing I can think is that I skipped Edie Claire’s Never Mess with Mistletoe so that I could read it this December. Thanks, again for the kind words about my Cozy Mystery site! Yes I have, but it didn’t affect my reading of the series. Caro, I think that now of days authors try to be super careful about mentioning a lot about things that went on in previous books since they know some people read their books out of sequence. One author who I used to read was sooooo careful not to mention previous culprits that I stopped reading her series. The killer in one book was a pretty important secondary character who I thought she should have addressed about not having him in her next book. But, that would have ruined the previous book for those who don’t read books in their chronological order. I too start with the first in a series when I find a new author to read. I usually go by my local library’s listing but sometimes miss an e-book in between leaving me lost for a bit. Just finished Isis Crawford’s A Catered Costume Party. Almost one year since I read the last of Bernie and Libby adventures. That happened to me recently. I’d been about to begin a book that was the most recent in its series & I always look on the cover where it says “author of _______” which is usually the previous title in the series. So if the title doesn’t look familiar (particularly with books that come out one new one in series once a year) — I check up that title on Amazon to see what it was — to refresh my memory on what was last story & what happened to the characters last time. This time, the previous title was totally unfamiliar! I ended up checking it out as audio book (cuz my public library didn’t have that title as ebook & I wasn’t interested in waiting a couple weeks for the print title on hold!) — Was my first experience with audio book too (which I wrote about in comments on previous post). Margaret StashEmpress, good thing you were able to get the audio book! I absolutely love listening to audios – especially when the narrator is really good. Generally I keep a list of the series I read, but not each book in the series. (even at that, I’ve fallen behind). So this has happened to me on occasion. For me, it’s important to read the series sequentially. However there are others that don’t care, my daughter being one of them. There are some series where it isn’t as necessary to read sequentially as other series. Jeanne Dams Dorothy Martin series is an example of that. Whereas, with Sally Goldenbaum’s Seaside Knitter’s series it’s really necessary to read in order to be able to understand the flow/growth of the characters. Thus, it depends on the author’s focus in their story. BUT, but, but having said all that, I have deliberately skipped a book in a series because I just didn’t like it. Ironically, this has happened recently with a few of the series I read. However, I most likely will pick up the next book to read. ALSO, I’ve found that not every book in a series is created equal. Authors (especially those with a long series) can have a ‘miss’ on occasion. In one series I was reading, a new book was released a year or two ago. In several previous books there was a thread or hints of something nefarious. When the book was released (I think it was the 6th or 7th book) to explain this activity, I just couldn’t read it………………I even tried three times, but only got to page 25 or so. The problem was with me because it got rave recommendations by several readers on this blog. Since I like the characters I most likely will try the next book. MJ, I had actually listed the Edie Claire book that I missed on her page on my site! I am still wondering how I skipped it! Also, I totally agree with you about authors having some books that just don’t stack up to some of their other books. If they’re favorite authors of mine, I go ahead and read the book. But if there are two books in a row that are “misses” for me, then I drop the author. I have read several of my favorite series out of sequence to begin with – I will pick up a book in a new-to-me series at the library or at a book sale; or download it from one of the book sites, & then go back & read other books in series. If there is a special relationship developed over the series (think Milo & Emma in the Alpine mysteries or Dwight & Debra in the Bootleggers Daughter series), I will go back at some point & read from the beginning to follow the timeline of the relationship. AAAHHHHH…………the disadvantage of getting so involved with book characters! After all, it’s ONLY FICTION!!! I’m glad you continued to enjoy the series. IF I had started reading the series with book ‘O”, I probably would still be reading it. This is just one case when starting at the beginning (and getting vested in the characters) didn’t work. Carolyn M, you’re so right about the character development and the relationships making the difference on whether or not you need to read a series in order. Off topic — Re: “It’s only fiction”! I find I get vested in the characters, especially with the romance angle when there are two possibilities (as many cozy authors pen their stories to start with). As a reader, I find that I have a ‘favorite’. I assume that’s because the author has written or steered it that way. When multiple books are written and the lead character is still indecisive, I find I get upset with the author. After all, I want that story line to go ‘my way’! Of course, the author is the creative force with her works. AND, she has a right to steer the series in whatever way pleases her. It’s presumptuous of me to want her to write a story the way ‘I like it’. Case in point, a couple of months ago, I stopped reading a book because the romance angle of the book (6th or 7th book) was not going the way I wanted. I wanted to scream, “doesn’t she see he’s a loser”! I vowed not to read any more books in the series until ‘he’ was out of the picture. Ironically. I missed out on a good mystery because of this side story. This particular book was recommended by several others because of the quality of the mystery story. I don’t know, I didn’t read it – my loss. However, if the romance story line remains the same in the next book, I still won’t read it. On occasion an author can create a story sideline that drags on way too long. MJ, I’m guessing you know why I became frustrated with the Wedding Cake Murder. I felt very vested in the characters and was very disappointed about how Joanne Fluke decided to go. I mean, there were a whole lot of books in which she kept us rooting for one (or the other) of the character(s). You’re right — the author is the “creative force” of the series. But, when an author does something to (maybe just) shake the reading audience up, or to bring in a new perspective to an old theme, he/she should be prepared to lose some loyal readers. MJ, I got to T and just can’t get even half way through that one. I don’t know if I will ever be able to read the rest of the series. I use the library to order my cozies, and sometimes I have to read them in the order they come to me. Drives me nuts, but it might take months to get the books in order so I don’t want to pass up the opportunity to read the books at all. But if I had my druthers, I’d always read in order. I’m a by the book-read them in order fan too but like you said, Susanne, (my mom’s name too so I’ll remember it) if I can’t get the book at all or have to read it out of order, I will. ie: Emily Brightwell’s Mrs.Jeffries series. And Anne Perry with the Thomas Pitt and William Monk series. If it comes to missing them, I’ll read them as I can. Where possible, I read other books in a series in the order they come out. Just keeps the people easier to keep track of and where the story line is going. Rob, agree, and sometimes the previous book gives the motivation for a character’s action. Sometimes it’s just a line, but the feeling is so delicious when I read the next book and understand why the character did or said something. Susanne, it would be difficult for me to read all of my favorite authors’ series out of order. I’d get pretty confused. Your library sounds like it stocks a lot of Cozy Mysteries. Sounds like a great library to me! Yes, on many occasions I do this when I discover a new cozy mystery author. The authors always say you can read their book out of sequence but what really irritates me is they spend so many pages telling the reader all about the characters, that to readers like me ,who finally find an author that fits my description of this category, will go back to the first in the series until I come to that book. I understand their reason for doing it. Actually your confusion in how you are explaining missing a book in a series is exactly how I feel when I’ve read a book out of order…or like you described, missed a book. I try to be careful but it has happened. I tend to read the books when they come out regardless of the time of year and then reread them at the corresponding holiday. There are some books I read every Christmas. I guess it’s part of my holiday tradition. Thanks for your blog. Have really enjoyed being a follower. Oh and another fun thing. The authors claim the books are stand alones. But then they should NOT casually mention something like, “So and so had just recently been voted in as mayor to replace the previous mayor who was now serving time for two murders…” So if I’ve just picked up this book because it looked good at the bookstore or library, once I’ve read this is there any point in my buying the previous title in the series?????? On a similar note, was reading a first book in a series and enjoying it very much. In the author’s email newsletter a contest was announced and to enter, just go to her website, read the first few chapters of the upcoming second book and answer a simple question. Ok, easy enough. Preview on the website very neutral, sleuth leaving work, her two (named) would-be boyfriends waiting for her at the door. Simple stuff. EXCEPT that ONE of the wannabe boyfriends named is the murder victim in the FIRST BOOK, which I was just in middle of reading!!!!! So now I’m not reading with an eye to figuring out who the murderer is — but rather looking for all the signs that the victim faked his death, figuring out who else has to be in on it — and wondering why. I’m sure that was not the author’s intention! It is hard to read a book out of sequence as sometime you miss meeting of a character or explanation of a situation. I like reading first book in a series than each book that follows in order. I keep track by reviewing the series online then keep track of all the books listed in a notebook. It helps. The only difficulty is if the library does not have the book on their shelped and have to order a copy from anot her library. STS, I totally agree with you! In this instance, I was lucky that I didn’t pick up on any previous happenings >>> although maybe I did and just wasn’t able to see any clues. Except for very few authors who have a lot of books in a series and I discover late in the list, I read books in order for all the reasons you shared. Then a few months ago, I was reading book 5 in Erika Chases’s Ashton Corners series and realized I missed book 4! Since I was more than 1/3 of the way into #5, I kept reading. It turned out to be ok and I found the missing book #4. I keep an index card for each author and list the books I have read and the dates completed. Luckily, I buy my books from Amazon and it keeps track of purchases! I prefer to read holiday books in season, too. Becky McF, in my case I think it’s going to be OK, too. In Margaret StashEmpress’s comment above she gave the example of skipping a book and then inadvertently becoming aware of who dunnit in the previous book. That would sort of take the fun out of reading the previous book… We both lucked out! I prefer to read chronologically, of course, but sometimes I pick up a new author’s book and it’s not the first in the series. If I fall in love, I go back and start at the beginning! I like to read a new author starting with a holiday book in the series. If I like that book I will start the series at the beginning. I have found that it often takes two or three books in the series before I finally click with the characters and settings. If I still don’t really like the series I cut my losses with that author. Love your website! I am a total list maker so this site is invaluable! Vicki L, first of all, I’m glad you’re enjoying my Cozy Mystery website. Thank you for the very kind words! Ooooh, goodness, yes. I have a TERRIBLE habit of starting a series in the middle. This is due entirely to the limitations of library availability, it’s not deliberate! It takes some getting used to. I’ve learned the library-jutsu of trying out a series any which way I can get it, and then (if I enjoy it), patiently going back to volume one and waiting as each book becomes available in sequence. I even re-read the first book I tried in sequence, which can be quite fun as all the references I didn’t previously recognize make sense at that point. It generally takes long enough to come back around in the sequence of borrowing that it’s entirely viable. As for revisiting a previously read series … all bets are off, there! I select my favorite books at any time, in a freewheeling manner and without regard for context of any kind! joQ, I used to rely on my library system to read books, so I know what you’re talking about. I remember reserving books as soon as I found out about them. I guess that’s why I think my Soon to be Released Mysteries page is such an important part of my site. I try to list the books on that page as soon as I find out about them. When I read out of order I get confused. When something comes up in the character’s life that doesn’t fit with the last book I read, it drives me nuts trying to figure out what happened! I have a huge library, following a lot of authors and with more than one reader in the house, I finally got wise and put all the authors into a private data base so we could keep track of who had read what. It took a lot of time but was well worth it. If I am going book shopping, I take my binder with me so I don’t duplicate or buy something to far down in the series. When I see a special for e-books, I just grab the notebook to see if I have it or need it. Kathryn, ditto what you said about your memory! Sometimes I even find myself getting some of the characters from one series confused with characters in another! I have read some cozy out of order. For me it did not mess with anything. I have a very hard time reading out of order. I now have a multi tab spreadsheet that I keep track of new books coming out, all the books on my various devices all in series order so I always know what book comes next. On my to buy sheet I have the author, title and series along with the date of release so I don’t miss a new book. I also use a software name caliber for all of my electronic books. I am a spreadsheet type myself. I previously used cards or binders, but my husband asked for a list of all my books for home inventory purposes and he wanted a spreadsheet. First there was the inventory that has a master list and a table for each author with title, copyright date and price. Then came my ‘wishlist’. These are the only books I am allowed to buy because I have often purchased the same book more than once. Then I found this website, so I have a spreadsheet with cozy authors I haven’t read, but who sound like I would like them – I use this list at a huge book sale I attend every year where the paperbacks are $1.50, so if I hate the book, no big loss. I don’t focus on getting the first in the series, but if I like the book, then I start from the beginning and read in order. Then I added my To Be Read list which includes the copyright date and series name and number(still recently read one out of order). Finally, this year I added a list of new purchases showing the cover price, what I paid and the tax together with the discount amount and where I bought the book. This last one is because my book budget has been growing, but I wasn’t sure how much I bought for myself and what I bought for others. I also needed to know how much I spend with gift cards as many family and friends give me gift cards. All of this requires that I have all these files on a notebook computer, that I take nearly everywhere I go. I also added the kindle app to my notebook and phone for those books that are only available as e-books, though I much prefer paper. Now my husband e-mails me his book list, which I download to my phone since he won’t get a smart phone or table. Modern electronics make it so much easier – my tablet weighs MUCH less than my binders did (I have about 2500 books, so the list was a lot of paper). Susy S, since I am now only reading my books in Kindle format, I’ve made folders (on my Kindle) where I keep all of the books I categorize all the books I haven’t read yet. When I moved from my old Kindle to my husband’s Paperwhite, I had to move all of the books – which I thought was tricky. However, when I read your description of how you keep your books categorized >>> I realized I’ve got nothing on you! Danna, I think it is a side effect of being an analyst by profession. I organize things to death at times, but organizing and reorganizing my books is a great stress reliever. Even with all that organization, I still read a book out of order and didn’t realize it until I was almost half way through and it was only a throw away line by a secondary character that clued me in to the fact. This in the same series were I was sure I had not read the first book, my list said I had, but I bought another copy (used – fortunately). I found the original copy when I was packing up some books that will be moved to storage until retirement. Silly not to trust my files, but what can I say. Your website has lead me to many more authors that I really like, and the reviews and recommendations help me pick ones I am more likely to enjoy. THANK YOU! Susy, you’re very welcome >>> and as a person who has created a website around organizing series information, I don’t think there’s such a thing as too much organizing! Missing a book has happened to me a few times. The culprit: a novella ebook every single time. A few authors don’t let anything ‘major’ happen in the in-between ebooks, but one time something major did happen. I had missed the ebook and was reading the next book in the series and I’m thinking: “What!? When did that happen? I don’t remember it!” *Sigh* I’m exceptionally careful now. I never ever read books out of order. My brother does and it makes me crazy! LOL. Danna and Margaret, I sooooo dislike those unintentional spoilers– although I question just how unintentional they are. The author has to know what he/she is doing. Arghhh! I hate those e-book novellas. When I look at a list and it shows one of these, but I don’t know it is only an e-book, I drive myself crazy trying to find the book so I don’t read out of order. Linda MH, I’ve done that, too! I think of novellas as a little treat between books, but they sure are difficult to keep track of! Yes I read books out of order. I try not but sometimes I do. Sue grafton s series I started with g and went backwards with that series. I keep a monthly list of books. I highlight paperbacks in orange and hardback in pink. If I have the book highlight in blue. Then I write each book on index card, orange for paperbacks written purple ink and pink for hardbacks written in blue ink. Then I make big author index with books listed in order. Ginger g, wow! That’s quite a system! I’d need to keep a note to remind me which was which. I’m pretty sure I’d forget which color-code to use! I have accidentally bought an out of order book an refused to read it until I got the missing one. I have a small binder with colored tabs to keep tract if what I have and need. My biggest problem is I love this website and find too many books to read.and to little time. But I love to read and can always get lost in a good book. Karen Scoppa, I am so glad to hear that you’re enjoying my website. Like you, I keep finding more and more authors to read. I really enjoy reading everyone’s monthly recommendations. I’ve found a lot of authors from those. I seem to pick my wine & my books the same way-the title cracks me up. If I get a book that is not the start of a series but I like, I will go back & read the rest. If not, I pass it by. My “to reads” list is too long. 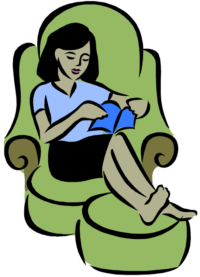 I read a lot of cozy mysteries and prefer to read them in order, but I’ve been reading them from my library’s downloadable system and often have to put them on hold so I do end up reading many of them out of order. the difficulty in reading them out of order really depends on how character interaction is handled through the series. In some series, you have one main character that the series is based on and a new crime and new supplemental characters with each book, so it doesn’t really matter. But when you get the main character interacting with the same friends, relatives and coworkers throughout the entire series, it makes it difficult to read out of order due to the development of their relationships. People marry, have children and die throughout the some series, and sometimes a supplemental character in an earlier book becomes a criminal in a later one. This gets confusing if those books are not read in order. I am not sure if this is the proper place to make this comment. Thus, finding your wonderful list of senior sleuths, I am going to bookmark this on my android/tablet. Carol, I’m glad that you find the lists useful!